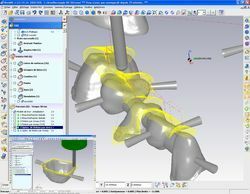 WorkNC Dental is a CAD/CAM software solution for automatic machining of prosthetic appliances, implants or structures through the use of perfectly optimized toolpaths which benefit from state-of-the-art technologies already tried and tested by thousands of users in the highly demanding automotive and aerospace industries. WorkNC Dental reflects Vero Software's 20 years experience and expertise in the field of CAD/CAM. Not only are production cycle times greatly reduced thanks to the use of machining processes (this is just one advantage compared to existing dental solutions on the market) but also the high quality finish of the machined components means that no manual reworking is required. The WorkNC Dental graphic interface, which is simple and easy to follow, has been specially designed for prosthetists and dental technicians who are not experts in machining technologies. WorkNC Dental comprises a comprehensive range of automated and interactive procedures that will help the user throughout the part machining preparation process - the choice of the machining blank, the addition of support pins and finally the launching the machining process itself. The process starts with an impression scanned by a non-contact 3D laser scanner. The scan data is then used to generate a digital model from the impression with the CAD software. The virtual CAD model is then used to generate the desired prosthesis design. Next both the completed design and the digital model are ready for programming in WorkNC Dental automatic CAM software. The process is completed by machining both the completed restorations and their model in 4- or 5-axis on laboratory CNC milling machines.